No one cooks up a tastier stew of murder, mystery, and mayhem than New York Times bestselling author Diana Mott Davidson. 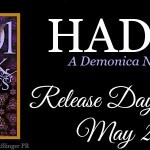 In time for Mother’s Day, satisfy your own cravings for mystery and chocolate or gift to your favorite lady, with another tasty and suspenseful adventure. 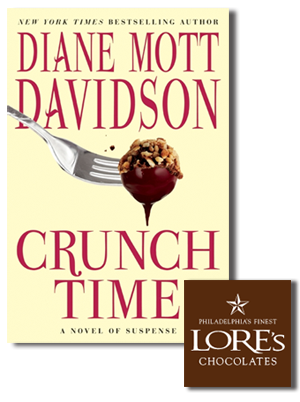 Savor your signed copy of Crunch Time with a box of Lore’s Chocolates-an indulgence sure to satisfy all! 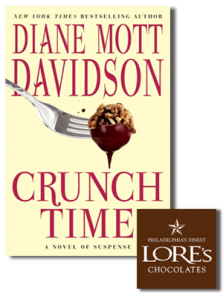 • Signed first-edition copy of Diane Mott Davidson’s New York Times bestselling tale of murder, mystery and mayhem, Crunch Time. 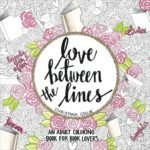 Caterer and sleuth extraordinaire Goldy Schulz returns in another tasty and suspenseful adventure. • To celebrate caterer Goldy’s latest dishes, Lore’s Chocolates, using the finest ingredients to make the finest chocolates, offers a special sampling of their famous Milk Caramels and Dark Vanilla Buttercreams. Induldge your taste buds as caterer and amateur sleuth-extraordinaire Goldy Schulz, digs into a deadly smorgasbord that includes a heaping helping of murder!